Yup, teeth. Specifically, my 94-year-old grandfather's teeth. He finally decided to get dentures after years of chewing with fewer teeth than my 11-month-old. The dentist had to pull the remaining teeth, and my mom, who has been well-trained to give me xrays and other peeks inside the bodies of immediate family members, thought to ask the dentist if she could have her father's teeth. Before I even dumped them out to get a better look at them, I peered into the bag and commented, "I didn't know grandpa had a crown." His wife retorted, "He didn't. He never had a crown." It was kind of a strange reaction since, well, it is pretty damned clear from even a cursory look that the maxillary right central incisor (RXI1) is a porcelain crown on top of a real root. Maybe my grandfather had had that crown for decades and his wife didn't know? Or one or both of them forgot? 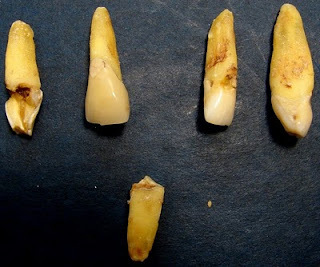 The other teeth are pretty badly chipped and carious - there appear to be an upper right lateral incisor (RXI2), an upper left lateral incisor (LXI2), an upper left canine (LXC), and a mandibular right central(?) incisor (RNI1). Perhaps there were more teeth that didn't come out whole and therefore that I didn't get from the extraction. But if my grandfather really was eating as well as he was with only five teeth, I might have to rethink what edentulousness meant in antiquity. Seriously, he ate bread and corn and candy and pretty much everything he had eaten before, just cooked a bit longer. Plus, he's healthy as a horse - clearly his poor dental health has not caused further problems for him. I'm not quite sure what I'm going to do with these teeth. But I keep trying to convince myself that it's no creepier than having, say, a lock of someone's hair. It's not, right?